The RiverCity Rage beat the Wichita Wild 43-20 on Saturday, August 1, 2009 and will represent the United Conference to play the Intense Conference winners, the Billings Outlaws in the first ever 2009 IFL United Bowl Championship on Saturday August 15 at 3:15 p.m. central time. This is the first time in the history of the RiverCity Rage to be a part of the League Championship. 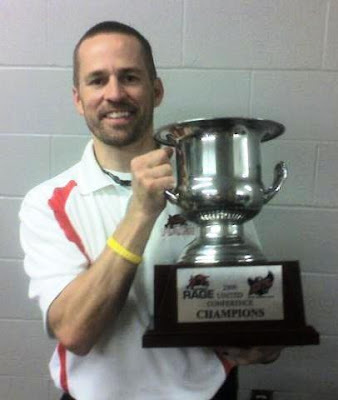 Rage Athletic Trainer and SLU Faculty Member Jason Bennett hoists the Conference Championship Trophy.